The general assembly of the European Choral Association–Europa Cantat, the European choir federation, will be held at Circolo dei Lettori. Torino has been chosen for this important European meeting as the big festival Europa Cantat XVIII will take place here from 27th July to 5th August 2012.
International book fair – Atelier for those who have never sung in choir: Choir, first sight love! An atelier open to everybody dedicated to those who have no musical knowledge.With Alessandro Cadario, eclectic conductor of choir and orchestra and also director in two ateliers at the Festival Europa Cantat, you are going to be involved to an improvised choir, better if you have no choral experience, you'll be lead through the exiting experience of hearing your own voice in an harmonic ensemble. You will see the building, literary, of a music you'll feel to belong. A very special and interesting way to interpret a classic concert: a choir improves his study and rehearses a new piece in front of the public. It is an occasion to meet and discuss with artists, ready to answer to some questions from listeners and very pleased to talk with those who want to know better different aspects of repertoires and choral world. 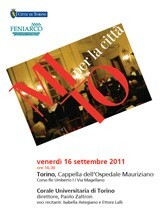 The choir involved is theCorale Polifonica di Sommariva Bosco, conducted by Adriano Popolani.